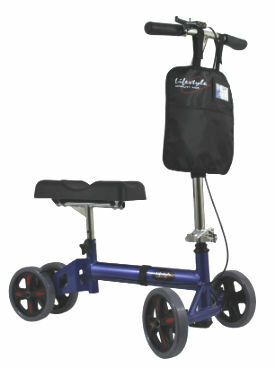 KN2000 Knee Walker is foldable and features a Rack and Pinion steering system- making it super easy to maneuver. Tool free height adjustment of tiller and seat. Solid one piece padded knee platform. 8? caster wheels are ideal for indoor and outdoor use. Easy to use hub braking system. Easy folding mechanism for storage or transport. Convenient tote included. Aluminum Frame with 8 inch wheels. Weight capacity is 350 lbs. Available in Blue or Red color.